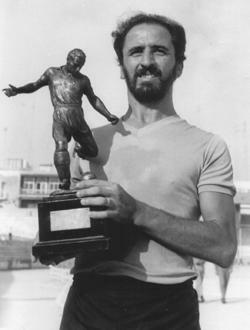 Leli Fabri with the Player of the Year award. Today's story took place in April 1980. The 1979-80 football season was drawing to an end and Valletta FC were already declared champions. However, although the league issue was already resolved, there was still a place in the UEFA Cup to play for. There was, of course, the FA Trophy left to be played with its added prize of a place in the qualifing round of the European Cup Winners' Cup. This, however, was still some weeks away. Before the start of the last round of matches, Sliema and Floriana were level in second place with 26 goals. Sliema still had to play Birkirkara while Floriana had a game with Marsa in hand. Both teams were expected to win their matches and so finish in joint second place. In any other season this would have necessitated a decider to determine which team would play in the UEFA Cup. That year, however, the MFA decided to apply the goal-difference rule to decide the final placing of the league contenders. Having a nine-goal lead over their rivals, Sliema, therefore, only needed to beat Birkirkara to make sure of a place in Europe. The Stripes, however, were no pushovers and although the Blues were favourites to win the game, Birkirkara were expected to, at least, make a game out of it. Birkirkara, however, disappointed not only their supporters but even more so, those of Floriana. Sliema won 7-0 thanks mainly to a suberb display by their top-scorer, Leli Fabri. The Blues were determined to win the game with as big a score as possible and this was obvious by the way they came out fighting from the word go. It took Fabri only five minutes to open the score. Sliema's international midfielder dribbled his way past three defenders before shooting diagonally past goalkeeper Cutajar. Thirty minutes later Fabri made the score 2-0. Pouncing on a loose ball, he beat Cutajar with an unstopable volley to the far corner. At that stage Birkirkara were still very much in the game. Mario Monreal was unlucky to see his superb first-timer being saved on the ground by Charlie Sciberras. The first half ended 2-0 for the Wanderers but the game had barely re-started when Fabri completed his hat-trick. This time, he beat Cutajar with a hard drive on the ground. Two minutes later it was Oliver Losco's turn to hit the rigging for Sliema's fourth goal. Ten minutes later Fabri was back on the war-path and then, Mario Schembri and Losco completed the debacle. Fabri finished the season with an impressive total for a midfielder of 15 goals to share the top scorer award with Nardu Farrugia and Emmanuel Cristiano, both Valletta. Birkirkara were left dazed and humiliated but the worst hit were Floriana who were left with the impossible task of beating Marsa 16-0 to win a place in the 1980-81 UEFA Cup. Fabri made his senior debut for Qormi in 1968 against Zebbug Rangers and from then on he never looked back. Between 1969 and 1974, Qormi enjoyed two short spells in the First Division, which in those days was the equivalent of the Premier League. Fabri was by far, the most promising player in the division and the other clubs were soon jealously eyeing the youngster. Hibernians and Sliema Wanderers both made strong bids for his transfer but he preferred the Wanderers. At the end of 1973-74, Qormi were relegated to the Second Division. This made it impossible for them to hold on to their talented youngster and before the start of the new season he completed his move to Sliema. This was the start of a brilliant career for Fabri. The 70s and 80s were not the best of years for the Sliema club. It was a period when the Blues even suffered the indignity of relegation but on a personal level Fabri was always among the honours. In 1980-81, he was voted Player of the Year and the same year he won the coveted Sportsman of the Year award, one of only a handful of footballers to win this prestigious award. Fabri made his international debut on September 28, 1973 in the 2-1 victory over Canada. He went on to win a total of 28 caps for Malta, scoring three goals in the red jersey. He carried on playing up to the end of 1985-86 when he finally gave up the playing side of the game after a career spanning more than 18 years.